Murshidabad is one amongst the few historical places around Kolkata which certainly make for perfect weekend getaways. From gardens to palaces and tombs to temples, there is a lot to explore within the boundaries of Murshidabad. Due to its historical and religious significance, Murshidabad has become one of the most visited tourist destinations in West Bengal. So, how about planning a trip from Kolkata to Murshidabad this season and discovering the rich history of the city? Murshidabad experiences a hot type of climate; hence, the summers are hot and uncomfortable here. The best time to visit Murshidabad is from October until the end of April. During this period of time, the climatic conditions are favourable and comfortable. By Air: The nearest airport from Murshidabad is at Kolkata at an average distance of 220 km. By Rail: You can catch a direct train to Murshidabad as it is well connected to Kolkata and nearby cities and towns by rail. By Road: The roads to Murshidabad are in good condition. Hence, it is easily accessible by road from Kolkata. Murshidabad is located at a distance of about 230 km from Kolkata. You must take route 1 if you are looking to reach your destination within minimum time as route 1 will take 30 minutes lesser in comparison to route 2. You can reach Murshidabad from Kolkata within 6 hours through route 1. While on your way, you can take a break at the following places too. Also known as the Royal Heritage City of West Bengal, Bardhaman is popular amongst tourists and passers-by for its ancient buildings and temples and is known to be in existence since the Stone Age. It is located at a distance of around 137 km from Murshidabad and 100 km from Kolkata. Bardhaman has derived its name from Lord Mahavira who stayed for several days at this place. The major places which you must not miss visiting in Bardhaman include Curzon Gate, 108 Shiva Temple, Damodar River Beach and Hawa Mahal. Due to its multicultural heritage, you can also find several mosques and churches in Bardhaman. Baharampur is a small city in the district of Murshidabad and is popular for its ancient monuments such as Dutch Graveyard, Jafarganj Cemetery, Kathgola Palace and several others. Baharampur is located at a distance of around 11 km from Murshidabad and was the first headquarter for the East India Company. It has also been inhabited by several nawabs and sultans of Bengal. The presence of numerous historical monuments proves the rich history of Baharampur. Several other places which may interest you include Nasirpur Palace, Phuti Masjid and Khushbagh. Murshidabad is a historical town which is located on the banks of Bhagirathi river. Due to the presence of several ancient monuments and architectural masterpieces, it is one of the most visited places in West Bengal. During the Mughal Era, Murshidabad was the capital city of the Bengal region and hence, you can find numerous forms of Mughal architecture within the boundaries of Murshidabad district. From palaces to mosques, there is a lot to explore in this beautiful city. Following are the major places to visit in Murshidabad. 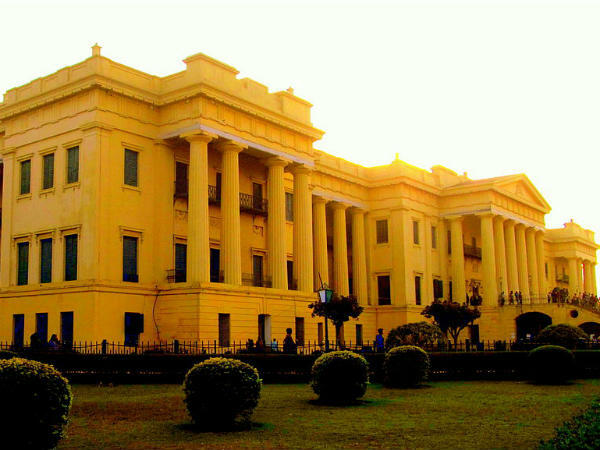 Formerly known as Bada Kothi, Hazarduari Palace is the most visited monument in Murshidabad. It is also one of the places that flaunt the finest architecture in the state of West Bengal. Completed in the 19th century, it is an Italian-style palace which has 1000 doors out of which 100 are built falsely in order to confuse the predators. Hazarduari Palace is a must-visit place in Murshidabad and should not be missed by any traveller or tourist. Built by Nawab Mansur Ali Khan in the 19th century, Nizamat Imambara is the largest gathering hall of Shia Muslims in India. It is one of the most significant historical and religious sites in Murshidabad and hence, remains crowded with tourists throughout the year. To several Shia Muslims, it is also considered one of the major pilgrimage centres in India as it was built by using the soil brought from Mecca. This was done so that the Muslims who cannot afford to go on a Hajj yatra can come to Nizamat Imambara and pay their respects to their lord. Even though the major occupation of the people living in Murshidabad is related to agriculture, it is still a significant centre of handicrafts and silk farming in the state of West Bengal. Hence, you cannot miss visiting the markets of Murshidabad which are stocked with handicraft goods and silk sarees and scarves. So, how about purchasing a few items in these beautiful markets and keeping them as souvenirs? Built in 1724, Katra Masjid is a tomb dedicated to Nawab Murshid Quli Khan and is one of the finest examples of architecture in Murshidabad. It is named after a market, Katra, which was located in the vicinity of this tomb. Surrounded by double-storeyed cells, Katra Mosque is built out of red bricks with four minarets at every corner. Due to its architectural and historical significance, it attracts thousands of history lover and tourists every year.